For a long time, comparisons of cinema and photography have been predominantly a question of contrast, both of their forms and their ways of seeing. This special issue of Cinéma&Cie reverses the perspective, by addressing some of the fundamental spaces of convergence and coexistence between the two languages. While they have always been somewhat present in the history of the two arts (not only in chronophotography, but also astronomic photography, photographic series, and still photography), the photocinematic forms have become particularly relevant in the archaeology of post-media culture that has characterised much scholarship lately. What tools should we employ to study these confluences today? Is it possible to perceive overlapping images also in strictly cinematic or photographic works? 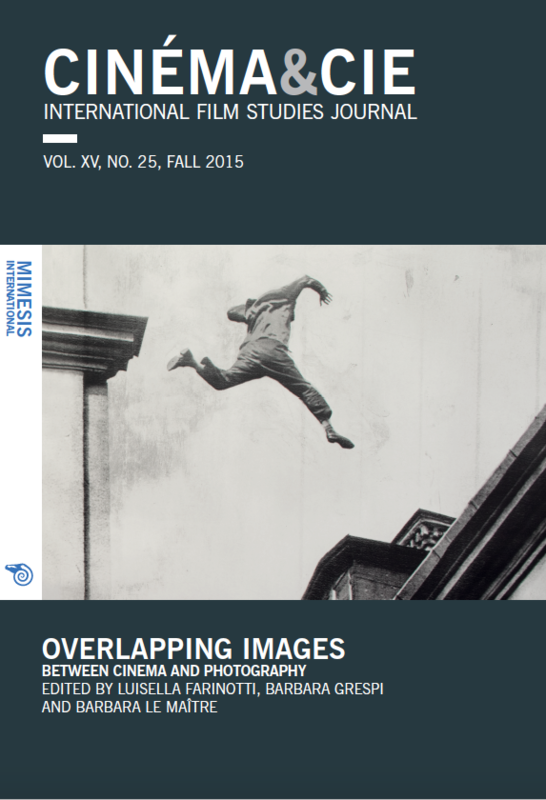 From this perspective, the special issue deals with borderline authors, such as Jeff Wall; post-filmic aesthetics, such as the cinematic tableau vivant and innovative examples of contemporary, experimental audiovisual production. Though the post-media condition erases their specificity, cinema and photography, in their mutual dynamic, have reappeared overwhelmingly in contemporary media practices and theoretical reflection, specifically since a renewed interpretation of the still-moving dialectic has become a crucial dimension of the contemporary image. Therefore exchanges, overlaps and bonds between the filmic and the photographic categorize the prevailing paradigm not only in the analysis of the new forms of the image, but also in reinterpreting the history of the two media and of their earliest and perpetual intersection. The historical reconsideration of the connection between cinema and photography demands clarity in some grey areas that so far have been neglected, such as film stills, analyzed in the following essay. They constitute a complex dispositif of exchange between cinema and photography, and not by chance are central to much innovative research on the photographic. Historical analysis and visual experimentation have progressed in parallel, both interested in a ‘return to the past’: to the origin of our gaze, but also to a different relationship with images. Hence, having first identified the necessity to adopt a perspective on media relations based on confluence instead of influence, the essay deals with two symptomatic forms of confluence between cinema and photography. First, a form of ‘compressed cinema’ that gives up on time and on the flow of the images and instead is condensed within a single photograph (like in Gregory Crewdson’s works); second, a sort of suspended photography, that takes on the incompleteness, the dynamism and the temporality of cinema, thus transcending its boundaries (as in Linda Fregni Nagler’s Pour commander à l’aire). Through the analysis of two case studies – namely, images of Venus’s transit across the Sun, captured in 1874 by Pierre J.C. Janssen’s photographic revolver, and the advent of spectro-cinematography performed for the first time by Josep Comas i Solà during the Solar eclipse of 1912 – the present article seeks to claim and substantiate the strict correlation between photography and cinematic device, recalling what Jean Epstein has defined as ‘the lens philosophy’. In fact, both the photographic and cinematic apparatuses, along with the microscope and the telescope, not only surpass the physiological flaws of the human eye, allowing us to see the un-observable, but moreover contribute to the elaboration and development of new philosophical-scientific systems about the Universe, via their images of celestial bodies. I demonstrate therefore how both of the cases under analysis delimit a specific phase of the history of astronomical images. Changes in the latter relate to the production technique and its underlying representation models, thus corroborating the role played by the astronomical image in the permanent dissolution, attenuation, and redefinition of the frontier between photography and film, instantaneity and duration, and the discrete and the continuous. Lewis W. Hine’s series on the construction of the Empire State Building, published in 1932 in Men at work – the photographer’s only book, offers a pioneering form of photographic enunciation within the history of the medium that is inspired by the cinematographic language. Compared with the evolution of photographic illustrated magazines during the twenties, and the use of montage by the designer Stefan Lorant, Hine’s series appears to be the first to have employed cinematographic continuity to express an allegorical idea: the links between the pictures are like the links between the men at work. A brief detour via Eisenstein’s theory of montage helps understand that just as each picture is a part of the whole series, each of the men is a part of the working class who built the highest skyscraper in the world. In the 1880s chronophotograpic still images dissected the otherwise indistinguishable stages of bodily movement, revealing both the discontinuities between still images that are hidden in cinematic images, and the details of gestures that are imperceptible to the human eye. According recent film theory, chronophotography reveals that aesthetic fruition is not based on continuity alone, but also on instantaneity, discontinuities of movement and the dichotomy of immobility and motion. The essay argues that chronophotography can express the dynamis of Warburg’s engrams and Eisenstein’s expressive movement, as well as its organic nature and the qualitative changes it enacts on the body. In Eisenstein’s opinion, the changes that occur in the work of art trigger the spectator’s imitative process, which in turn is responsible for ecstatic flow. The article considers Choros (Langan and Maher, 2011) and the media art project White Horse Hills (Wood, 2002), both of which render chronophotographic, engram-like images of movement through digital techniques. In their analysis, I claim not only that they both emphasize their chronophotographic effect, but moreover that they strengthen the dynamis of gesture, thus demonstrating its importance in aesthetic fruition when it is in line with the laws of nature. From the very start, electronic language and video technologies have provided a free territory for expanding and reformulating multiple artistic itineraries, as well as a point of confluence for the most creative dialogue between different media. Raymond Bellour’s work has been significant in defining the role that video has played in the media context, describing it as a passeur between systems of old and new images, between the mobile and the immobile. Following the digital turn, it seems that the most obvious legacy of video in today’s digital system lies in the transfer, within the logic of computers, of that vocation for integration and intermediation which has always been acknowledged as its genetic characteristic. The computer becomes itself a passeur between the history of photography, the cinema and the experimental electronic world, increasing the possibility of interweaving influences, both practical and conceptual. The essay describes the work of some contemporary artists (Mittelstäd, Vogel, Klasmer), where the choice of a notably inter-media representation condenses the spirit of the history of photography and moving images, in a parabola that originates in pre-cinema to reach electronic experimentation and go towards the all-comprehensive logic of the metamedium-passeur. How can a work of art reach beyond the borders of the medium to which it would logically seem to belong? Following a brief reflection upon an important essay by Rosalind Krauss, “Reinventing the Medium”, this contribution focuses specifically on one of Jeff Wall’s works, allowing the author to deal more directly with the issue of the dialogue between different mediums. Through the analysis of Dead Troops Talk, the aim of the article is to demonstrate: first, how the so-called photograph does not exploit the potential of its own medium, but instead applies a compositional strategy borrowed from the pictorial medium; and second, how the same photograph undermines the genre of historical painting (to which it is linked via its compositional strategy) by putting the fictitious – and cinematographic – figure of the zombie at the center of the representation. Recent art cinema has produced several experiments in the tableau that conceive entire movies based on its aesthetic. Such films blur the boundaries between cinema and installation art, and consist of a loosely connected string of tableaux which gain a degree of autonomy and therefore cannot be interpreted in the contexts of cinematic narration and dramaturgy. These films are usually categorized as slow movies, and indeed their duration has inspired the majority of their analysis in film theory. Nevertheless, I suggest that we should focus on the similarities between the tableau sequences of slow movies and the installations of moving image tableaux in order to highlight the ways they revitalise the traditional, intermedial figure of the tableau vivant in art, and foreground the single, photographic frame within moving images. Referring to recent reinterpretations of the notion of the transmedial dispositif and to the revisions of the tableau mode in art (and the ideas of Jean-François Chevrier) I propose to contest Raymond Bellour’s idea of the ‘battle of the dispositifs’ and concentrate on aspects of the complex convergences between the traditional visual arts and the new media of moving images that underlies the tableau aesthetic in post-cinema. Taking into account the implosion of the tableau vivant into a more generic tableau style, I examine a set of gestures and actions of folding together photography, painting and cinema that may define the post-cinematic ‘mise en tableau’ (via examples from the films of James Benning, Lav Diaz, Gustav Deutsch, Raúl Perrone, Apichatpong Weerasethakul and Tsai Ming-liang).